Despite her contentious relationship with her father, Veronica wants to know who shot her daddy dearest, Hiram. This leads her to Jughead whom she paid a sizeable wad of cash to find out who shot her father with another payment upon completion. Jughead goes down a few different avenues during his investigation while hiding the dead body of Tallboy from his newly appointed sheriff father. While FP isn’t buying the story that Jughead, Sweet Pea, and Fangs, are selling, he’s apparently also oblivious to the smell of a poorly hidden dead body under the bed he’s sitting on. Alrighty, then. 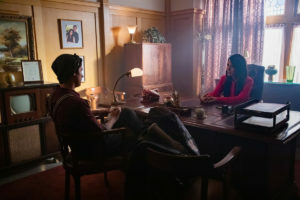 During Jughead’s investigation, he questions Hermione about the shooting. Although she was on the phone with Hiram when he was shot, she reveals that she recently discovered that Hiram was having an affair. 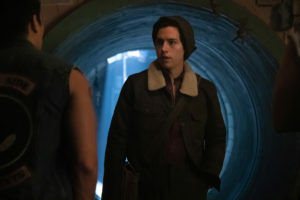 While looking for Hiram’s mistress, Jughead and Betty stumble upon Penelope’s brothel at the Five Seasons where a woman helps point Jughead and Betty in the right direction, but Betty has to meet Dr. Curdle Jr. to help out her own investigation leaving Jughead alone to suss out the mystery woman: Mrs. Mulrway. She works for the water safety board and falsely reported that Sweetwater River was safe and did so for Hiram. To add to the mystery, Jughead gets a call to meet Sweet Pea at a cabin where we find – to everyone’s surprise – Sheriff Minetta is alive and well and has been having an affair with Hermione for months. 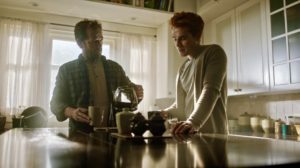 Plus, they are discussing framing FP Jones for something but, thankfully, Jughead is smart enough to figure out a plan to help both his dad and his Tallboy problem. FP gives a statement to Alice Cooper about “what happened” to get ahead of the situation which causes a stymied Hermione (she recognizes the corner she’s in) to tell Jughead that he can’t share what he knows otherwise, FP will go down with her. Finally, Hermione resolves her loose end that is Minetta by shooting him. In the end, Jughead tells Veronica that Tallboy was responsible and she decides to leave it at that, even though it’s a flat out lie. Meanwhile, Betty is on the hunt for a killer. Betty has connected the mysterious poisoning deaths of so many in Riverdale: Daryl Doiley, the nuns, Principal Featherhead, and now Claudius Blossom. Betty’s prime suspect is Penelope Blossom namely because Daryl died by oleander poisoning, which is something only the Blossoms grow. The trouble is, how does Betty go about proving her case and bringing a murderer to justice? Well, she bribes a coroner to check some old files, of course. As it turns out, Penelope’s husband Clifford didn’t just hang himself, he was poisoned first, so that’s another body added to the pile. Upon confronting her auntie Penelope with the evidence, Penelope drops a few well-timed bombs. First, she’s only been killing men who deserve death, and second, Claudius was the cause of all the seizures. The runoff from the Fizzle Rocks production was contaminating the water and was causing the seizures in the girls. In Clifford’s case, he killed his own son, so Penelope took revenge upon him for that. However, Penelope turns the tables on Betty by calling out her misdeeds in the form of leaving Chic to die by the hand of the Black Hood. The two are at a stalemate. Archie has gone off the rails. I thought we were getting a new and improved version of Archie after his near-death experience, but I was so very wrong: This newer model is aggressive, angry, and looking for a fight. After trying his hand working for his father again and getting fired after one day on the job, Archie found himself at La Bonne Nuit drinking his troubles away. Reggie tried to cut Archie off but instead of calling it quits, he made a scene. Thankfully, Josie was there and came to the aid of the idiotic Archie. Bonus points to Josie for shoving him in a tub for a sobering cold shower and to give him time to think about his actions. Archie decides he needs to confront his demons one last time and visits Hiram in the hospital…with a gun. After a little speech, Archie is just about to shoot Hiram after his little speech when someone else enters the room with a gun. Archie shoots the intruder who runs off, Hiram wakes shortly after and the two come to a truce. After this incident, we were finally gifted with a refreshed and attitude-adjusted Archie who is back with his guitar in hand and hoping to do music with Josie again. The news of Hiram’s incapacitation has spread like wildfire through the underground mafia world and the vultures are smelling weakness. Veronica’s “friend” Elio: remember him? The one who tried to scam her during her casino night? He warned Veronica that families are looking to move in on Hiram’s territory, leading Veronica to partake in a deceptive gambit (idea provided by Smithers, her old doorman) to keep the family name strong. For reasons we can only guess, Veronica employs Reggie as a decoy Hiram for business purposes. While I suppose one could argue that she’s doing this to protect the family and her name, I struggle with understanding the reasoning behind it when she’s always been very anti every illegal enterprise that her father partakes in. I guess she’s daddy’s little mafia girl after all. Veronica also fired her father’s security guards for failing to keep him safe and recommending her family align with Elio’s for protection. If that wasn’t enough for Veronica to contend with, she confronts her mother about being part of Hiram’s drug operation since her name is on the papers, literally. Hermione explains away everything by saying she found out about the drug operation and told Hiram to shut it down, which is why she ordered the quarantine in the first place. And now that Hiram is incapacitated, she wants to sell the business and the drugs and make some money on the side. Veronica is 100% not on board and ends up destroying the drugs before Hermione can sell them. Unfortunately, Veronica made a little mistake because the cash was paid upfront for that sale and that cash went to keeping the family name clean with the governor. So now there’s no drug operation to sell and Hermione can’t give a refund with funds she doesn’t have. Josie suggests boxing at the gym with Kevin’s dad. FP shot Hiram. It was his own form of payback for Riot Night when Jughead nearly died. Curdle Jr. admits to faking Minetta’s death for Mayor Hermione Lodge. Oops. Tallboy is the fake Black Hood who took shots at Hermione during the mayoral debate.